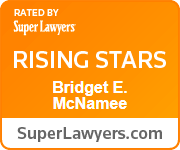 Bridget E. McNamee is a Senior Associate, representing employers across a variety of industries, including restaurants, healthcare, and retail, in the prevention and defense of employment-related claims. Bridget strives to provide counsel that will assist clients in navigating employee issues, complying with the law, and avoiding litigation. Bridget also has general commercial litigation experience. She has represented institutional clients and governmental bodies in state and federal courts and administrative forums through trial and appeal with respect to employment matters, as well as cases involving contractual claims and defenses, real estate, and title litigation. Bridget received her undergraduate degree from the University of Florida, and her Juris Doctor from Duke University School of Law. She has served on the Board of Directors of Voices for Children of Tampa Bay since 2013, and served as the President of the Board in 2017 and 2018. Bridget has been appointed to The Florida Bar’s Legal Needs of Children Committee since 2016. Bridget was born in Winter Haven, Florida.